(NaturalNews) Heavy metals are becoming more pervasive in our food, water, and air supply to the point they are turning up in products that we have previously deemed completely safe. Mercury is one heavy metal in particular that has ended up in our physiology in a variety of ways, and as a result, is causing the slow poisoning of our bodies to the point of acute illness. Here are some of the common signs. There are no shortage of reasons why people have digestive problems, but one common factor that many do not consider is mercury poisoning. This starts for many in their mouth as the chewing of their food releases salivary enzymes, as it simultaneously stimulates the release of mercury from their fillings. This mercury mixes with your food and travels down to the digestive tract with it. In the stomach this mercury combines with hydrochloric acid and produces mercuric chloride, which can damage the stomach lining and create ulcers. Not only that, but once this mercury comes into contact with our friendly bacteria in our intestinal system, it can kill them instantly by touching them. Unfortunately, this does not harm the mercury and it continues to destroy other friendly bacteria in its path. This ultimately leads to imbalanced gut flora which creates a multitude of conditions and symptoms, most notably Candida Albicans and other digestive related disorders. Mercury is lipophilic, meaning it concentrates in fatty tissues, mostly the brain as it is comprised mostly of fat. 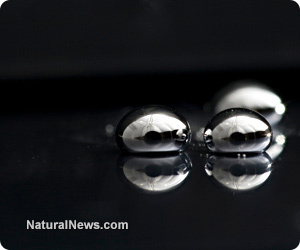 For this reason alone, it makes sense that any level of mercury poisoning is going to negatively affect the proper functioning of the brain due to mercury binding to it. Unfortunately, it appears that the neurological development of fetuses, infants, and children are much more susceptible to mercury poisoning than adults, which may explain rising rates of brain related disorders like autism in infants exposed to vigorous vaccination schedules that contain mercury. Brain related symptoms from mercury poisoning include late development of walking and talking for infants, and poor memory, attention, language, and fine motor and visual spatial skills. This is often labeled as dementia, autism, ADHD, Parkinson's, depression, migraines, and more. Since mercury has an affinity for concentrating in fatty tissues, and tends to accumulate over time, it should come as no surprise that it can cause severe muscle and joint pain, including stiffness and swelling. Signs of mercury toxicity in the musculoskeletal system include tender muscles, rapid muscle fatigue, joint stiffness, muscle cramps, muscle weakness, and TMJ dysfunction. This is often labeled as arthritis, fibromyalgia, chronic fatigue syndrome, and multiple sclerosis. Mercury is found in the air, drinking water, fish, dental amalgams, vaccines, occupational and home exposures, batteries, red tattoo dye, and more. Be careful to avoid highly polluted environments and the food and water near them, as well as medical procedures that subject you to mercury. Detoxing from heavy metals is one of the most important, yet most difficult things to do for your health. It typically takes a long period of time to remove them safely and effectively, so starting right away and using sound medical counsel is vitally important. First of all, consider a holistic dentist who specializes in the removal of mercury amalgams. Secondly, work with a holistic practitioner who understands the proper food, supplementation, and digestive and liver/kidney support required to safely and effectively remove mercury from your body. Ensure you are properly detoxified in other areas, and have been properly nourished before you consider starting the process.